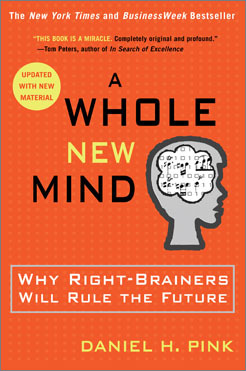 Daniel Pink's 2005 bestseller A Whole New Mind changed the way business leaders thought about the future. His futurist thinking of six years ago presciently describes the current economic transition the U.S. is facing. He also gave business strategists a vocabulary to discuss the emerging conceptual economy, and he inspired young business minds to focus less on traditional and easily outsourced MBA studies and focus more on deeper problem-solving business pursuits. Most importantly, he highlighted our firm, Animators at Law (now A2L Consulting), as an example of one of those companies already living in the conceptual economy. It was a great honor to have been noticed by Dan Pink. He has firmly established himself as one of the top business thinkers in the world. His book has now been translated into 20 languages, he appears regularly on morning and daytime talk shows and his TED Talks are legendary in business circles. Being recognized is an honor, but I believe one of the greatest experiences one can have is to be understood. I believe Dan Pink understands Animators for exactly what makes Animators special: our unique approach to trial consulting. Our clients are the top litigators in the world (we have worked with more than 95% of top law firms to date), and we provide them with precisely the creative problem solving that Dan Pink describes. In his book he lays out the six fundamental aptitudes of the new conceptual economy, worker or organization: Design, Story, Symphony, Empathy, Play & Meaning. These aptitudes read like a job description at Animators at Law, or the way that we describe our trial consulting services to litigators. I believe they also read like a script of how the modern litigator should communicate and are thus worthy of a closer look. Design: Good design is well planned. Great information design often goes unnoticed, because we see it as simply something that works (e.g. effective signage or a great newspaper info graphic). A compelling trial presentation resulting from effective trial consulting should be just that; it should work without a lot of fanfare. The oral presentation should work similarly and be well planned in advance and thus well designed. Paraphrasing a recently retired litigation legend and Animators client, your presentation should be so well planned that when traveling for a long trial, you should never sleep better. Story: The facts and information that support your case are part of the story, but as Pink would say and I would completely agree, it is "the ability to place these facts in context and to deliver them with emotional impact" that matters most. The art of oral storytelling is not lost and certainly should not be lost on the modern litigator. Storytellers make people care. They make things memorable. They provide the necessary drama that humans require for long term memory to take hold. Your fact-finders must care, and effective trial consulting that delivers storytelling techniques and effective trial presentations is an essential tool of the modern litigator. Symphony: Pink describes symphony as an ability to paint connections between seemingly unrelated relationships. I imagine he would also describe the big picture that a litigator must paint in opening and closing as an example of symphony. Opening and closing are the opportunity for a litigator to connect the dots. This should be accomplished through a combination of trial graphics and an oral presentation. Done right, order is made from chaos. Empathy: Great litigators can imagine how judges and jurors will receive their message. Those who are effective emphathizers understand how a particular message will land on their fact-finder and what emotions that message will evoke. Clients who work with Animators often test graphics and argument themes using focus groups and mock juries for good reason. Our goal in conducting jury research or research for a bench trial is to tweak the combined approaches of the graphics team and trial team until we receive a replicable winning outcome in testing. Play: Play is not a word we usually associate with litigation, however it does have a place here. Pink does not mean being childish. Instead he talks about making the art of doing business an enjoyable undertaking. The litigator's trial presentation should go beyond dry and boring slides. In my view, it should just cross the line between information and entertainment. It should never be cute, but it is okay to cause judge or jury to chuckle. Our goal in every trial consulting engagement is to find the right balance between information and entertainment. Meaning: Who cares? This is the question that a litigator should be asking. Why should the fact-finder care about your client at all?Whether an inventor whose idea has been stolen, a foreign electronics manufacturer or a major oil company, the audience still has to care. It is the job of the litigator to find this meaning no matter how seemingly unsympathetic their audience. At Animators at Law, we do what we do because we love it. Our clients are equally passionate about winning, and our trial consulting services contribute significantly to that effort. Whether you are on our team or a customer, I know you will be better conceptual thinker for it. I believe Dan Pink would agree.